The submissions to the 2007 Pretoria photomarathon will be exhibited quite differently as compared to February’s show after the Johannesburg photomarathon. Because the exhibition space where the works will be on show now, the Outlet gallery in Pretoria (from September 28, if you’re interested), is so small, there simply wouldn’t be enough room to exhibit even a quarter of all the photographs if I’d use the same method. Also, it was a bloody pain to string them all up. The works will be exhibited in two ways: As a video slide show and as one poster with all the submissions as thumbnails. The poster is released under a creative commons license. In this case, that means you can copy it, but not make money with it. You have to specify who the original authors are and you can’t make any derivative works. All that said, what you can do is download it and print it. 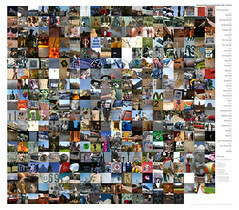 The work which is hosted at Flickr prints to a nice 41cm by 36cm at 300dpi or 82cm by 72cm at 150dpi file. However, as there’s an upload limit of 10MB for images uploaded to Flickr, the original, which is not on Flickr, prints sweetly to 82cm by 72cm at 300dpi or double those numbers at 150dpi. If you’re interested in obtaining a large hi-def print (82x72cm at 300dpi), you can order one with me for 350 Rand. That is at cost (remember, creative commons). However, this also means you will have to pick up your print at the opening of the exhibition of the Pretoria photomarathon, on September 28. You will also have to pick it up before 7pm. There’s also another print going to be available with the winning photographs and photographers highlighted in the matrix of images. I had quite a struggle getting the above image together. You’d think it’s fairly straightforward, but it wasn’t. Here’s how I ended up constructing the work. Resize all original photographs with the longest side no longer than 640 pixels. I used FastStone image viewer for this. It’s fast and does good resizing. I’m not aware of a fast, good, simple program under OS X that does that too, easily. Fireworks also could do it, but struggles if you want to batch files from different source folders. Also done with FastStone image viewer. It turns out all these digital cameras shoot at slightly different dimensions. The shortest short side of the resized images was 427 pixels, the longest 480. 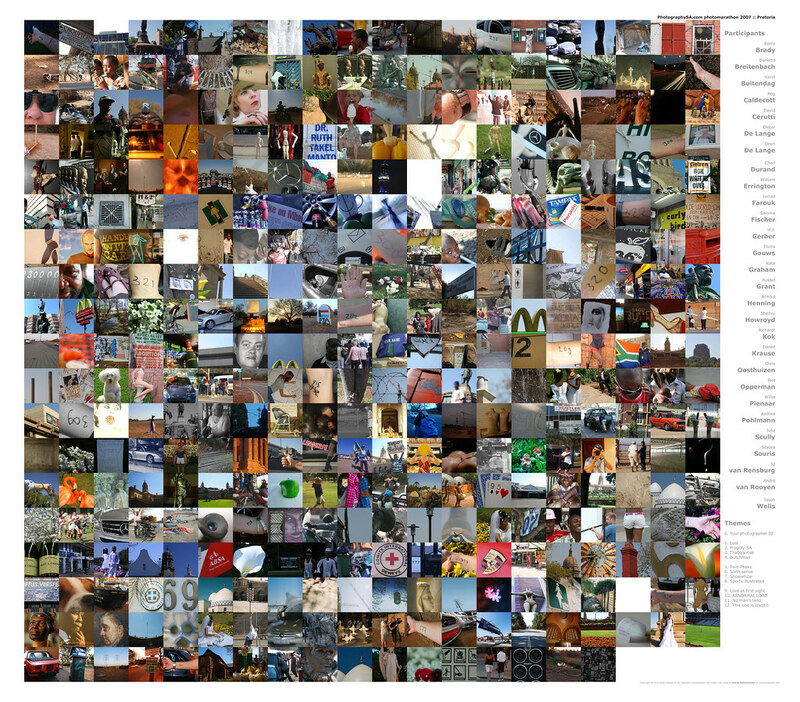 I cropped all images, taking the middle 420×420 pixels. Again with FastStone. Every photographer has his own folder with his 13 images (12 themes plus one photographer ID). For each folder, I ran a batch that renamed all the files, numbering them sequentially from 0 to 12. I first wanted to construct the matrix using Fireworks. Here, you can drag files onto the canvas, opening them inside the current document. Handy. There’s a grid to which you can snap your images. Handy. However, my version of Fireworks can not handle files larger than 6000×6000 pixels. Problem. And, as it turns out, images don’t always snap to the grid nicely. Photoshop then. Handles large files, has a grid (although the maximum grid size is small), but each image needs to be opened separately to get it onto the canvas. Problem. So I created a html page which loops through an array with all the folders of all photographers (hard coded in an array) and then prints all photos sequentially. That’s why I renamed all the photos in the previous step. Of course, I only renamed them after I found Photoshop and Fireworks weren’t going to do the job. Take a screenshot of the resulting page. I have a nice extension in Firefox called Screengrab! (with the exclamation mark). However, taking a screenshot of the large HTML page created a image full or rubbish. Then I tried Paparazzi! (what’s with the exclamation marks?). That wouldn’t make a screenshot of a local file. Then I installed a nice little app called Red Snapper for Safari (OS X’s browser). A screenshot was easily made and I ended up with a picture roughly 8500×8500 pixels in size. Added the names of the photographers, a heading, a footer. Et Voila, as the French would say.